Lloyd Alexander TS - yellow with white roof, 1957. 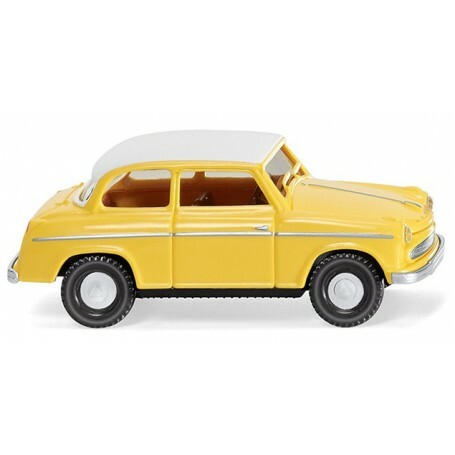 Vehicle body calcite yellow, interior and steering wheel copper brown, radiator grille and bumper painted. Chassis in black. Transparent front headlamp inserts. Front headlamp rings and Lloyd lettering painted silver. Side ornamental strip, door handle and radiator grille painted silver. Silver-painted handle. Roof surface and wheel rims in white. Tail lights hand-painted carmine red.